This is a premier product from Ekwa Marketing that is specifically designed to help build a social connection with potential clients through attention-grabbing banners and short videos. This connection will help build trust, create and maintain better relationships with you and your clients and provides the perfect tool to interact with them directly so that you become their first choice when looking for the service you offer. Q: What type of banners or videos provided? We provide a variety of banners to choose from – Educational, Wellness, Celebration, Inspiration, and Interactive. Furthermore, we offer short videos that also help increase engagement on your profile. Q: Can I add my business logo and contact information to the banners? Each banner will have a customized footer that will display your logo and contact information such as website, phone number, and address. Q: As an Ekwa client should I pay for the service? No. As an existing Ekwa client, this service comes to you free of charge. Q: I am not an Ekwa client, but can I use this service? Yes, DoneForMe Social is available to none – Ekwa members as a paid service. You can sign up for a package of your choice. Q: Can I change my plan after I sign up? Yes. You can upgrade or downgrade your subscription as needed. Q: Where will these banners and videos be posted? They will be posted on your Facebook, Twitter and Google+ profiles. Moreover, you can add them to your website, blog, newsletter or even email! Q: For more details how can I contact you? Feel free to send us an email at info@doneformesocial.com or call us at (312)239 0638 or, write to us via our Contact Us page. Q: What is the purpose of social media? Social media platforms present a great opportunity to connect with your potential patients. Our DFM team researches and creates banners & videos that are informative, interactive and entertaining. According to research most social media users log into their accounts at least once a day, while many check social media multiple times a day. By posting a variety of these types of banners & videos on your profiles your fanbase will get used to seeing your updates in their newsfeeds, and you will become top-of-mind to them for your services. Overtime familiarity and trust in you will grow so that when they want a service you provide you be their first choice. Q: How can I improve my social media engagement further? We will do a study on your profile and put together a proposal on how to further increase your SM engagement. In the proposal, we will make recommendations on how to be active on social media and increase the visibility of your business/practice. This, in turn, will grow the likes, shares, reach and followers on your profile. Moreover, each month we will work to increase your engagement on your SM profiles by providing new ideas for banners and videos. Q: Why are Interactive banners important? Social media is all about engagement. It is a platform that gives you a chance to break down barriers it leads to more familiarity and liking when the same people share posts about your business/practice with their family and friends. With more communication, loyalty and trust will grow. Research conducted by us reveals that many people dislike being exposed to information on procedures all the time as they are inundated daily with advertisements on TV, radio, billboards, etc. They don’t come to Facebook for advertisements but rather to make social connections. To achieve their expectations and in turn increase engagement on Facebook, we have created over 50+ banners on various subjects which have been approved by our clients. This strategy will help boost brand awareness and enhance SEO rankings. Q: Why should we use hashtags in social media postings? The importance of hashtags is that it makes it easier to find information on a theme or specific content and become searchable/discoverable by other users. Hashtags are the simplest way to organize the endless amount of information posted on social media. Although there is no limitation on the number of hashtags to add remember that ‘less is more’ so use three or less per post; and when you find one that works keep using it. Q: Why should taglines be checked when approving? We moved to a new system to provide all our clients with a better experience and make the approval process more convenient. The new app designed will automate postings in an efficient and effective way. We will choose taglines with optimized words to increase engagement on social media. It would be great if you can check the taglines as well when approving the banner. If you need an edit please send the request via the Feedback page on DFM dashboard. Q: Why are stock images used on social media banners instead of actual doctors? Every month we research on trending topics and create professional banners with appropriate stock images to cater to all our valued clients. We had also converted to the new app so that we can provide our clients with a better experience and easier approval process. Upon your approvals the new app we had developed will automate postings to serve our clients in an efficient way. Therefore we do not customize banners for each client. This is because customization for each client takes considerable amount of time from the allocated client hours. Q: Can you edit the social media banner or video? As a DFM product, all banners and videos are created on general topics and are offered to all our clients. We do no customize banners or videos for individual clients. Q: Can you send Insights report weekly or monthly? We do not give a weekly or monthly report but can compile a report on insights on request. We are currently working on an upgrade to the app we use to post the banners and videos once this upgrade is completed you will be able to get stats on insights of clicks, likes, shares, and comments etc., directly from the app dashboard. Q: I am hearing that the younger people are not on Facebook as much as they used to be. Should we join other types of social media platforms? We would love to hear your thoughts. Overall comparison shows the usage of Facebook is higher among all four age groups and especially highest among people in the range of 18-29. Moreover facebook also lists among the highest in the number of times these users visit these platforms on a daily basis. When users visit the page several times day there is a high chance of your posts being viewed by them. Therefore we recommend to continue with Facebook and we also post on platforms such as Twitter and Google Plus. Q: How does social media videos benefit my business/practice? The use of videos in marketing is on the rise. Research shows with a video, audiences are about 10 times more likely to engage, embed, share, and comment on video content than blogs or related social posts. Also with a video, audience are more likely to spend more time on your profile. The more time spent on your profile, the more familiar they are of your brand and business. 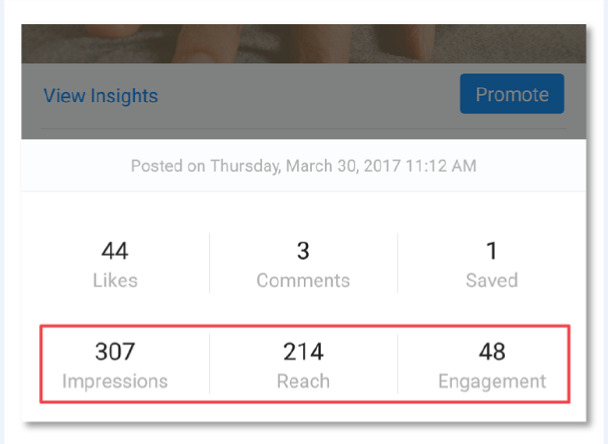 Q: My business/practice related posts get more engagement than the monthly banners. Why? Posting business/practice specific banners or videos makes a direct connection with your family, friends, staff and patients and thus more engagement. However when posting DFM banners we target all SM audience with general topics that focuses on “You, You” rather than always “Me, Me”. A great example would be a Wellness banner that provides dental tips. When such a banner is posted, SM audience would like and share with their family and friends. But they would less likely share a specific business/practice related post. We focus more on what audience wants rather than what we want. This would break down barriers between you and your potential patients. In turn it leads to more familiarity and liking when the same people share posts about your business/practice with their family and friends. With more exposure you will be their first choice when they want to go for a service. Q: My postings do not get more engagement. Is it worth spending my time approving the monthly banners? Social media is all about engagement giving you a chance to break down barriers between you and your potential patients. It builds up a friendship and liking towards you when the same people share posts about your business/practice with their family and friends. With more communication, reliability and dependability grow. Once people start trusting you and your business/practice they would turn to you as the first choice when looking for a service you offer. However, SM does not necessarily lead to a high increase in new patients, but at the same time, it should not be ignored either. Why? Because social media has become the wave of the future when it comes to advertising. If people do not feel your presence on social media, there is a good chance for competing service providers to take over. This is why we recommend taking a few minutes to approve the banners and let us do the rest for you. Q: My social media engagement is low. How can I improve it? As our valued client, you are entitled to Facebook / Twitter / Google+ postings every month. Without your consent & approval the banners will not be posted to your social media profiles and without postings taking place on a regular basis the engagement from the social media audience will be low to non-existence. If you have any concerns about the banners sent for approval, please take a moment to share your feedback via the Feedback form. Every month we research trending topics and create professional banners using stock images for our clients. We have recently started using a new app to make the approval process simpler. Once we receive our approval this app will automate the postings. We do not customize banners for each client because customized banners take up a considerable amount of client hours to complete. Q: How do I add business hours to my Page? Q: How do I Backdate a New Post? 1. Start creating your post at the top of your Page’s timeline. 2. Click next to Publish and select Backdate. 3. Select the year, month and day in the past that you want the post to appear on your Page’s timeline. Note: Keep in mind that you can’t backdate posts earlier than when the Page was created. Learn more about scheduling posts. Q: How do I Change the Date of an Existing Post? 1. Go to the post on your Page’s timeline. 2. Click … in the top right of the post. 4. Choose the year, month, date and hour where you want the post to appear on your Page’s timeline. Q: Can I merge 2 Facebook Pages? – You’re an admin of both Pages. – Your Pages have similar names and represent the same thing. – Your Pages have the same address, if they have physical locations. Before you request a Page merge, please make sure that any campaigns you’re running aren’t pointing to the Page that will be deleted. 2. Select 2 Pages you want to merge and click Continue. If you’re unable to merge your Pages, it means that your Pages aren’t eligible to be merged. If you see the option to request to merge your Pages, we’ll review your request. Q: How do I choose what I get notifications about? 1. Click account settings at the top-right corner and select Settings. 2. Click Notifications on the left. 3. Click to adjust how you get notifications and what you get notified about. Q: How to Turn Reviews for My Facebook Page On or Off? Q: How do I change my Page’s name? 2. Click Edit next to your Page’s name. 3. Enter a new Page name and click Continue. 4. Review your request and click Request Change. Q: How do I add or edit an address on my Page? Keep in mind that you can only add one address. If you’re unable to add an address to your Page, try changing your Page category. Q: How can I enable the auto reply for facebook page’s posts and messages ? Q: How do I link my profile or Page to my Twitter account? Only posts that have been shared with Public on Facebook will be shared on Twitter. Learn how to choose the audience of your posts. Q: What to do when Page Name change has been pending for over a month? In a situation where the request is still pending and you have not received any updates, please use the “Report a Problem” link on your account to let Facebook know more about what you’re seeing. Q: How do I give Admin access to someone for my Page? 2. Click Page Roles in the left column. 3. Type a name or email in the box and select the person from the list that appears. 4. Click Editor to select a role from the dropdown menu. 5. Click Add and enter your password to confirm. Q: How to add an existing Instagram account to your Facebook Page? 2. Click Settings in the top-right of your Page. 4. To add an existing Instagram account to your Page, click Add an Account. 5. Enter your Instagram account’s Username and Password, and click Confirm. Q: Can I upload a word or pdf document? You can upload a file to a facebook group page, but not to your profile. To do that you would have to upload the file to a cloud storage service like dropbox, and then post the link to the file on your facebook profile. Q: What is a verified Page ? If you see a gray badge on a Page, it means that Facebook confirmed that this is an authentic Page for this business or organization. Note: It’s not possible to purchase verified badge. Q: How do I add or change my Page’s cover photo? To add services to your Page, you must first add the Services tab. The Services tab appears in the left column of your Page. Now that you’ve added the tab to your Page, you can add services. Q: How do I post on a Page and who can see it? You’ll only see the option to post on Pages that have allowed visitor posts. Q: What are the FB guidelines to create a Cover or Profile image? 1. Use a unique image that represents your Page, like a popular menu item, album artwork or a picture of people using your product. 2. Be creative and experiment with images to see what your audience responds to best. 3. Review the dimensions for cover photos before uploading a photo. 4. Make sure that your cover photo follows the Pages Terms. Cover photos can’t be deceptive, misleading or infringe on anyone’s copyright. Q: How do I Respond to Facebook Reviews? 3. On the drop-down menu you will see a list of pages that you can manage. Select the business you want to post responses for. 4. Click on the Reviews tab under the page’s cover photo. 5. From there, you will be able to see all your reviews. 6. Sort your Facebook reviews by “Most Recent” so you can see your latest reviews. Q: Can you send FB Inbox messages daily? We check upon request and can send notification mail weekly when an message is received. Moreover we can add an automated message for replies. Q: Why is the Facebook Cover video blurry when playing? The quality of the video stream ranges from standard definition (such as 360p) to high definition (720p or 1080p) and based on the speed of your Internet connection the quality is adjusted. This is why you may notice that the quality of the video changing as you watch videos. On the video player and under settings you can select 720p or 1080p for best quality. The frames will become clearer. Q: How can I make the most of Facebook Covers? Any suggestions? The Facebook Cover photo is your opportunity to show off your brand. When you upload a new cover photo it is also posted on your timeline, giving your page greater visibility. In order to make the most of Facebook Timeline Covers we have a few suggestions listed below. Q: Can I have my FB Cover Photo changed every month? Q: Can I boost the social media monthly banners on Facebook? All our social media banners are validated for Boosting on Facebook therefore it can be boosted. If you want specific Ad banners for boosting purposes solely, our Ad team would assist you. Please contact us for further infomation. Q: How to delete a negative review? We cannot delete reviews on FB. We can hide them from direct view on your page in the tab category, but they would still be viewable at other places on Facebook, and thus, the web. Q: Why does a Paid Ad banner get more reach on FB? Two of the main misconceptions of social media is that being on Social Media converts to immediate sales and secondly, it is assumed to be free. And yes, it is free to some extent, but to really amplify your presence and brand awareness, you have to boost posts with payments. In fact, the post may not reach even half of the people that follow your page, but with a paid ad, you can make that post reach a larger portion of your audience. The more people reached, the more the brand awareness. It’s important to remember that when you use social media as an engagement and brand-building channel, you might not generate many leads or sales directly but you would indirectly. Q: Why is my Instagram getting spammed by unknown people? Private Account – When your account is private, only people you approve can see your photos and videos on Instagram. Your existing followers won’t be affected. Block Followers – The person you deleted from you followers list will not know they’ve been blocked. They won’t receive a notification, they can’t see your photos or videos in their news feed and you won’t show up when they try searching for you. Q: How can I link Instagram to my Facebook? We can only link accounts to Instagram via the mobile app and it does not allow us to link any via the desktop. Step 5 – Click on “Facebook” and it will take to Facebook options. Click “log in” and log in to Facebook from there. Then, turn on “Share your posts to Facebook”. It will then turn blue once activated. Q: How I can improve my Instagram engagement? 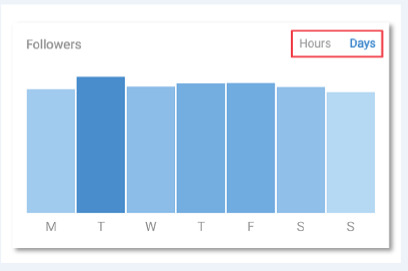 Besides providing a basic breakdown of your audience’s demographics, the native tool will also let you know the days as well as hours your followers are most active on the platform. Just tap on the respective option and view the histogram for the same. In this way, you can determine the best time to post your content so that it can reach out to maximum users. As you know, the analytics tool can help us analyze the overall performance of our posts. It provides us metrics like impressions, reach, engagement, etc. related to our content. Furthermore, you can identify the top posts on your profile as well. There are all kinds of filters that will let you know the exact insights for the provided time duration. If you have a business profile on Instagram, then you can add multiple Call to Actions on your profile as well. A lot of brands use Instagram to sell their products and reach out to their audience directly. If you have the same motive, then you should go to the analytics section and analyze the website clicks for the provided time duration. In the same way, you can know about the number of times your email or phone number was tapped. This will let you analyze whether your current marketing strategy is working or not. It will also help you come up with more engaging CTAs. Besides lead generation, a lot of people use this social media giant for brand promotion as well. If you want to create a distinctive brand presence, then you should know how many people have visited your profile. The analytics section will let you know the profile visits within a certain time frame. Additionally, you can also analyze the visibility of every post as well. This will let you know how many people have landed to that post from your profile, hashtags, or dashboard. 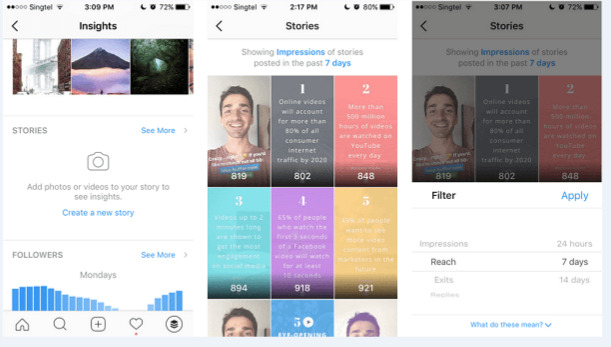 Instagram Stories can be used in numerous ways and to help us communicate with our audience. 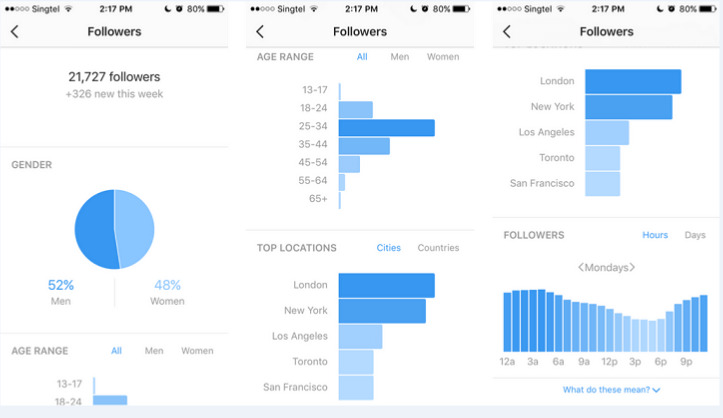 Though, there is hardly any tool that provides the analytics for Instagram Stories as well as the native platform. 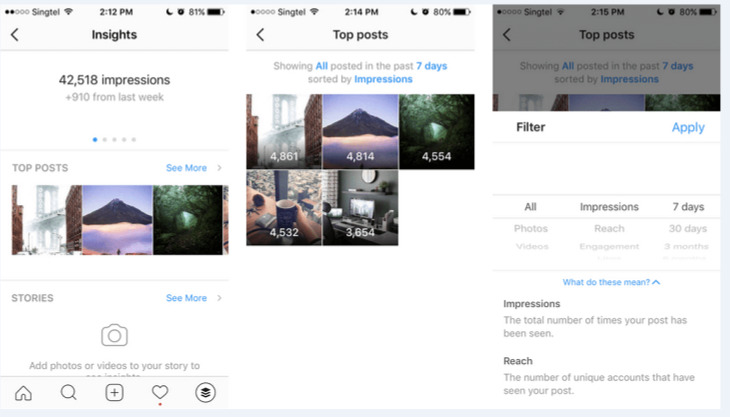 After visiting the insights for Stories, you can know the reach, engagement, replies, and more for the provided duration. You can also know which story had the most exits so that you can come up with more engaging content in the long run. Besides extracting the details for your top performing content, you can also analyze every post individually as well. Just tap on the “View Insights” option located at the bottom of the post. This will let you know about its total likes, comments, reach, saves, and more.